Azusa Pacific University is located in the San Gabriel Valley community of Azusa, 26 miles northeast of Los Angeles. Situated on 52 acres, East Campus is home to the College of Liberal Arts and Sciences and the schools of Business and Management and Music, and houses administrative facilities, classrooms, residence halls, a library, student center, and gymnasium. The 53-acre West Campus is home to Azusa Pacific Seminary, the schools of Nursing, Behavioral and Applied Sciences, Education, Theology, and Visual and Performing Arts, two libraries, the Richard and Vivian Felix Event Center, the John and Marilyn Duke Academic Complex, the Barbara and Jack Lee Place of Prayer, and numerous classrooms and offices. The 72,000-square-foot, $54-million Segerstrom Science Center is also on West Campus, serving multiple disciplines and the community at large. There are also seven offsite regional locations serving the High Desert, Inland Empire, Los Angeles, Monrovia, Murrieta, Orange County, and San Diego, as well as many online programs. APU students have many national and international study opportunities, including Los Angeles Term, South Africa Semester, Ecuador Semester, and study away programs. Moderate climate; mostly warm and dry throughout the year. 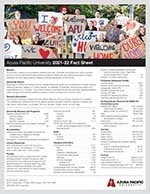 For a PDF of this information, download the University Fact Sheet (PDF), or to request a printed copy, email universityrelations@apu.edu.